mineral content above the minimum detection levels and hardness was an issue. They came to the HydroFLOW distributor in the southwest for advice shortly after they moved-in because they were concerned with heavy scale deposits evident on the faucet, aerators and shower heads. 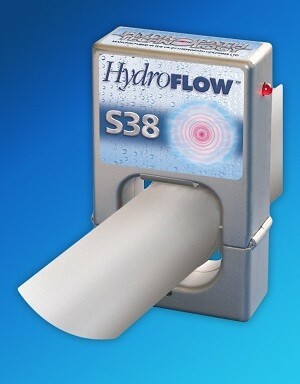 We recommended that they purchase a HydroFLOW S38 unit. After some deliberation, the homeowner ended up purchasing the recommended device and had it installed by their plumber. After watching the installation process, however, the customer concluded that she could easily have done it herself. After a few months had passed, she reported that all of her faucets were running clear, there were no water spots on their glassware or dishes, the glass shower door was free of spots and streaks and the aerators on the faucets and the shower heads had absolutely no deposits to clog their operation. After seeing the results, she decided to treat all the well water at the wellhead with HydroFLOW to kill bacteria and prevent scale buildup.